Martin alongside pupils at Goldenhill Primary and the Active Schools team. 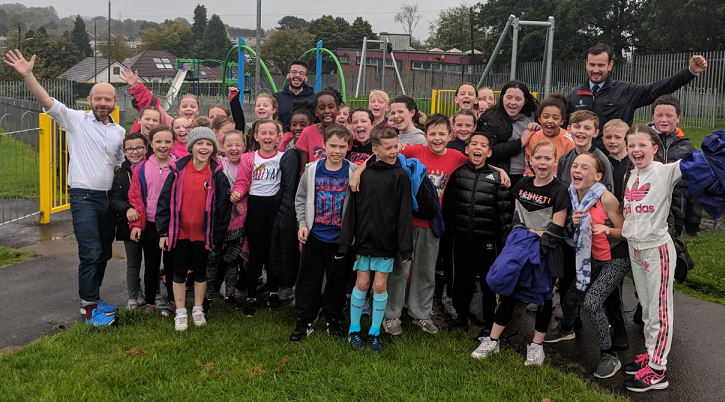 Martin Docherty-Hughes MP has welcomed an increase in the number of West Dunbartonshire school pupils getting active following a visit to Goldenhill Primary to mark National Fitness Day. The MP for West Dunbartonshire pulled on his running shoes after being invited by the Active Schools team to join local school pupils on a morning run at Goldenhill Park. This is a regular occurrence for these pupils, about 40 of whom attend the breakfast running club once a week at the school. The Active Schools programme is in operation at schools across West Dunbartonshire, working with all schools and local sports clubs to provide opportunities for pupils to get involved in sport and physical exercise before school, at lunchtimes and after-school – and in their local communities. National Fitness Day, which takes place on 26 September, aims to celebrate the positive impact of leading a healthy lifestyle and encourage people of all ages to get more physically active more often. It follows figures released last week by sportscotland showing that more youngsters than ever in West Dunbartonshire are getting involved in physical activity sessions thanks to the Active Schools programme. “National Fitness Day highlights the benefits of exercise and it’s great to see a record number of pupils in West Dunbartonshire getting involved in sport thanks to the great work of our Active Schools team. “More and more schools are building exercise into their daily routine which has a number of benefits – not just for physical and mental health but also educational attainment. “It’s been great to celebrate National Fitness Day with the pupils and staff of Goldenhill Primary School – one of our schools who have achieved the sportscotland Gold School Sport Award for excellence in PE and school sport. It’s not often I get to wear my trainers at work nowadays! “We continue to see a significant increase in pupil participation across the region in extra-curricular sport and physical activity and last academic year we reached a record high of 106,000 attendances and almost 50% of the school roll getting involved, which is fantastic. This is down to the hard work of the Active Schools Coordinators in partnership with school staff and our small army of over 300 volunteers and paid coaches who give their time to run the sessions.